 In 2009, Boston University student Greg Hum proposed this simple yet inexplicably awesome idea for a group bike ride. 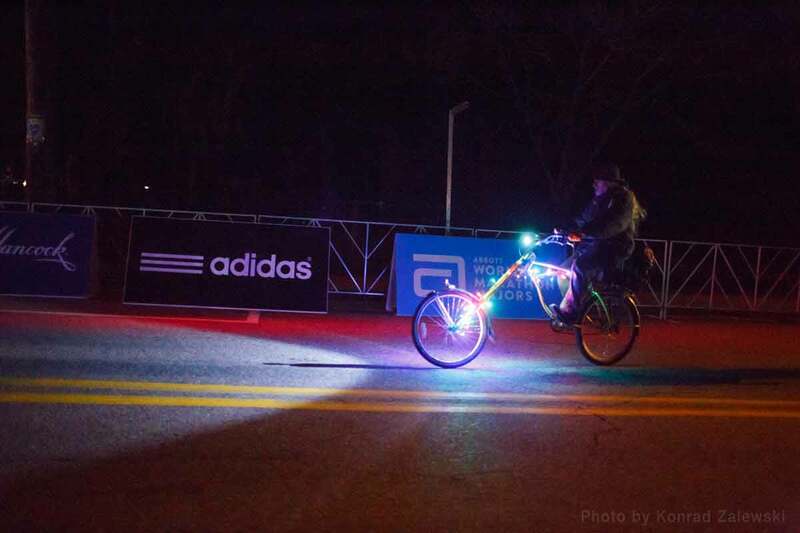 And thus, the Boston Midnight Marathon Bike Ride was born. 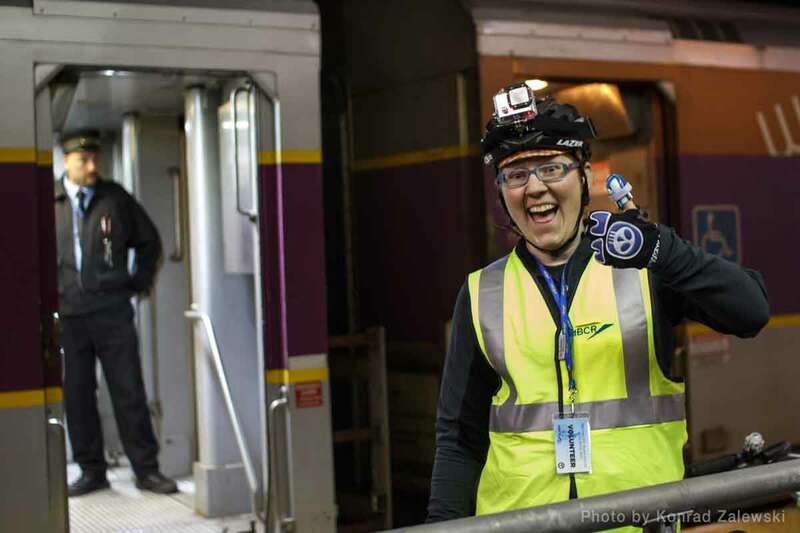 From a simple Facebook event for Greg and his friends, word spread, and about 50 people gathered at South Station to take the commuter rail out to the starting line. Many agreed to make it an annual tradition, and the following year 70 people showed up. 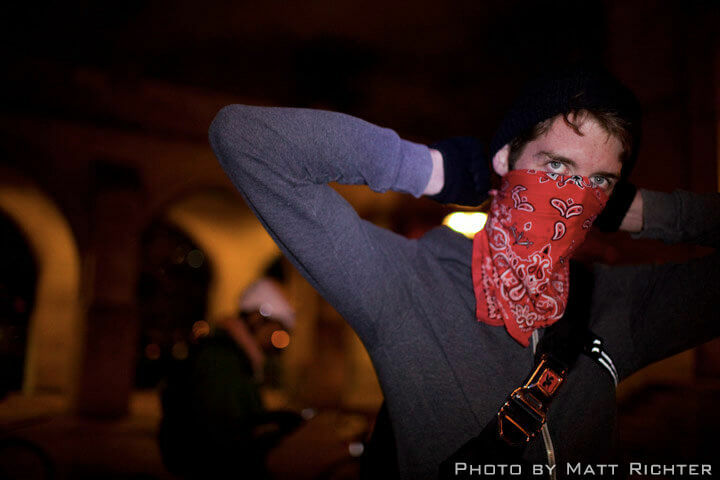 Starting with the 3rd ride, Greg teamed up with the Boston Society of Shenanigans, an underground cohort of urban adventurers and pranksters, to spread the idea and keep people on the same page. 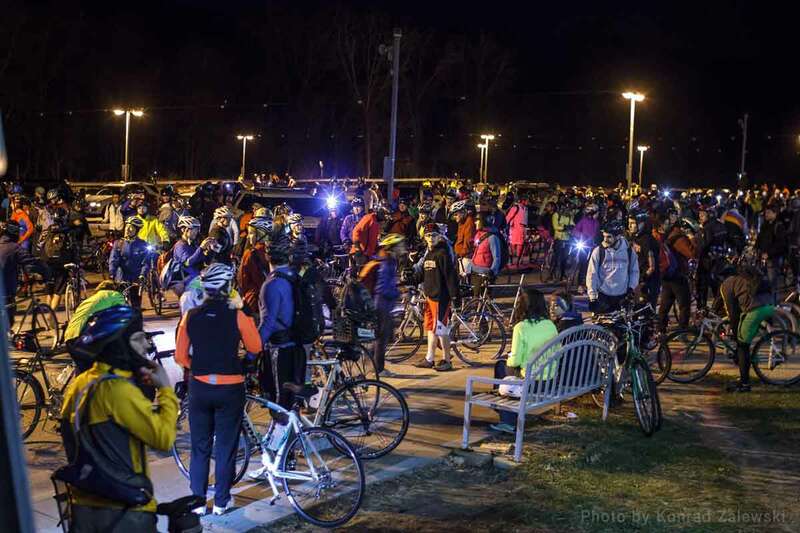 Today, well over 1,000 people take the train or get rides to the starting point to bike the route under the stars, from Southborough to Back Bay. 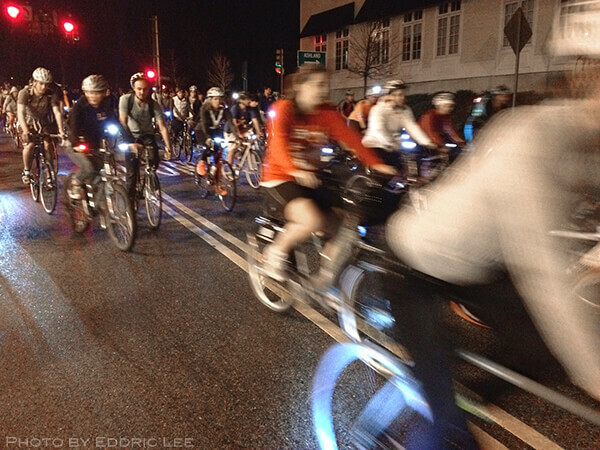 The Midnight Marathon is a group bike ride – not a race, and not even a marathon. In fact, at around 30 miles, it’s a few miles longer than a marathon! But don’t worry – it’s mostly downhill. 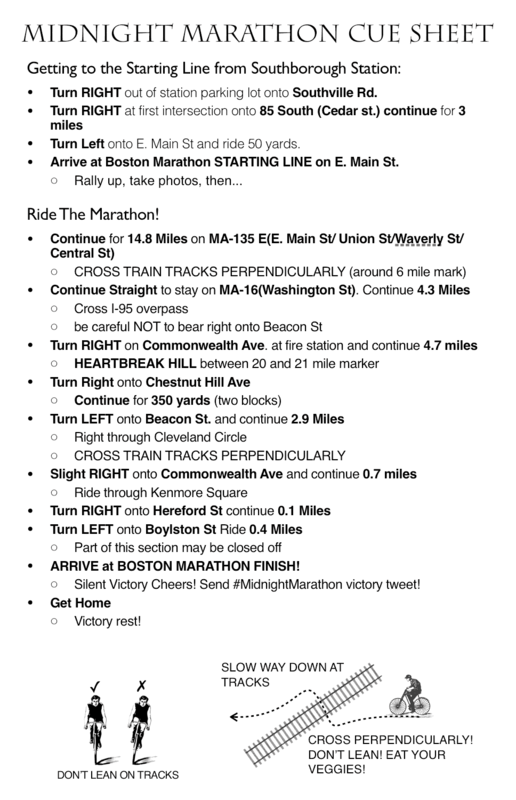 We start from the Southborough Station parking lot and follow the Boston Marathon route all the way back to town. Route B – This shorter route at 27.3 miles also benefits from avoiding the Cedar St hill. 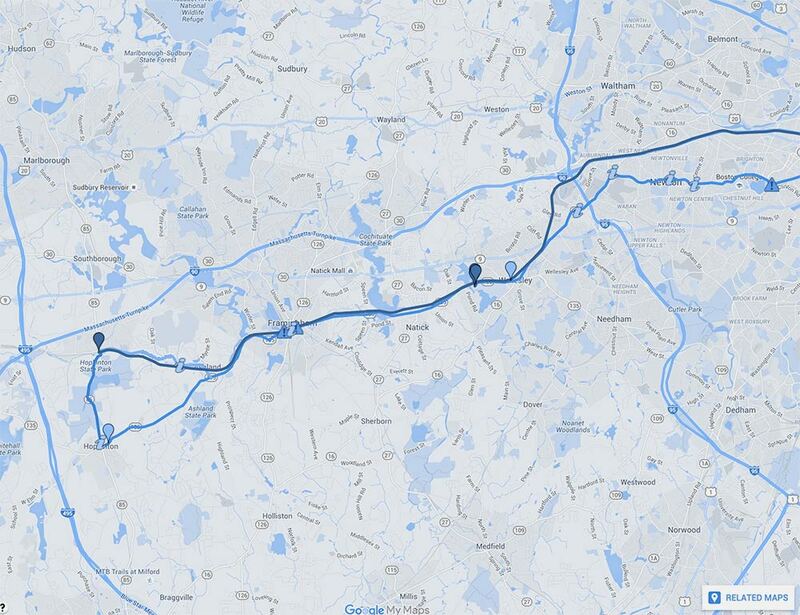 This is the route we did in 2014 – joining the main Boston Marathon route at the 4 mile mark. The first 4 miles are unsupported. If you’re starting late, looking to get downtown early, or just want to avoid that awful hill, check out the Route B Map. Riders get to Southborough by a variety of means, but mostly via the 10:40pm commuter rail departure from South Station. Unlike most nights, bikes aren’t allowed on this (already packed) train ride, but we can transport your bike between stations for a nominal fee. The ride is unsupported and show-and-go, meaning there is no official ride registration, ride leaders, road support, nor any official start or finish time, and most importantly, that you and your friends are responsible for your own safety. You can ride the route with friends any time the roads are open to vehicles and you follow the rules of the road. 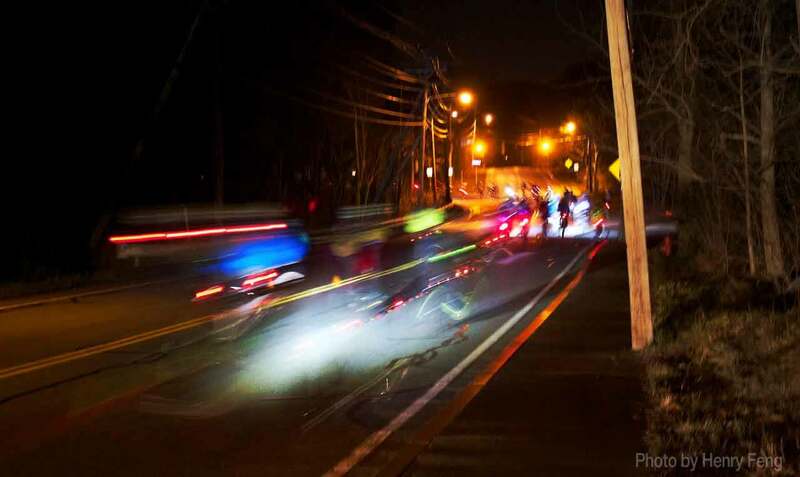 The main wave of riders arrive from Boston to Southborough Station just after midnight, but many people organize their own carpools and out-and-back rides before this. You can expect just as many people to be dropped off by carpool before midnight as arrive on the train after. For those needing bike delivery, only a limited number of tickets are available, so get them in advance. There are a number of ways to participate in the ride this year, however, taking your bike (or rental bike) onto the commuter rail isn’t one of them, and there will be no chartered trains this year. Regardless of how you get there, the ride will start from the larger of the two Southborough Station parking lots after the train from Boston arrives just after midnight. 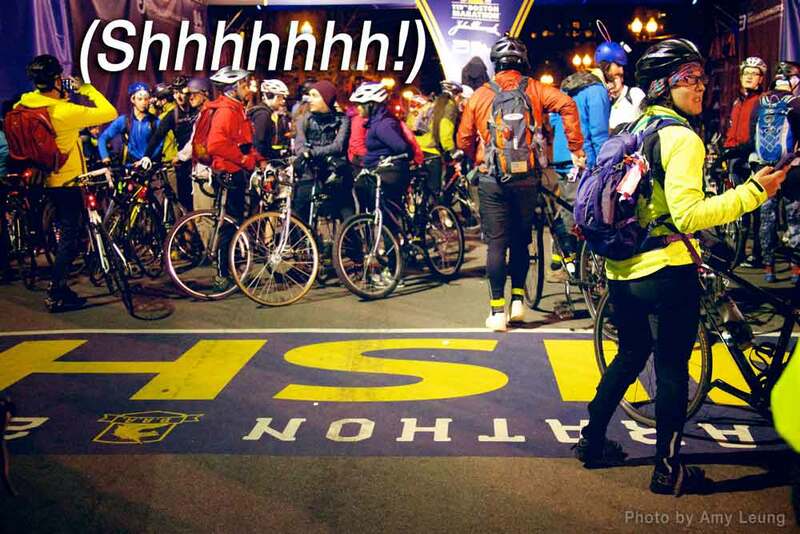 Let us transport your bike from Boston to Southborough while you ride the train with other Midnight Marathoners. Due to restrictions on bike transportation on trains, we have hired trucks and drivers to transport bikes from a parking lot near South Station to the parking lot by Southborough Station. After dropping your bike off with us you can take the 10:40pm train from South Station to Southborough, where you’ll find your bike will waiting for you. What we mean by “partially-supported”: We will do our best to direct riders at turns, warn of the train track crossings, fix flats, and help find stranded riders a way home, but you are ultimately on your own… together. We’ll deliver your bike to Southborough, but there is no registration and no official support on the actual ride. 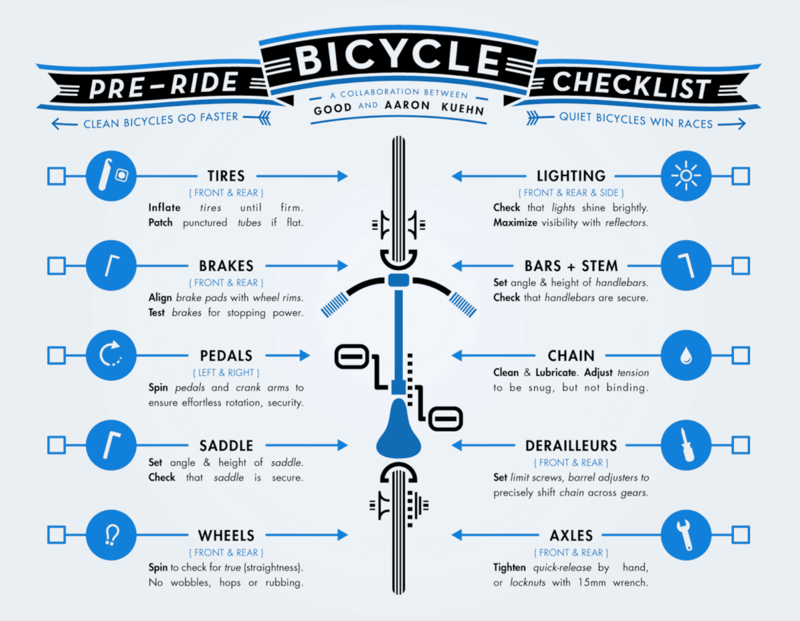 You’ll still need to prep your bike for the ride, be ready for flat tires, and have a backup plan if you get stuck on the route far from home. Want to choose your own adventure? 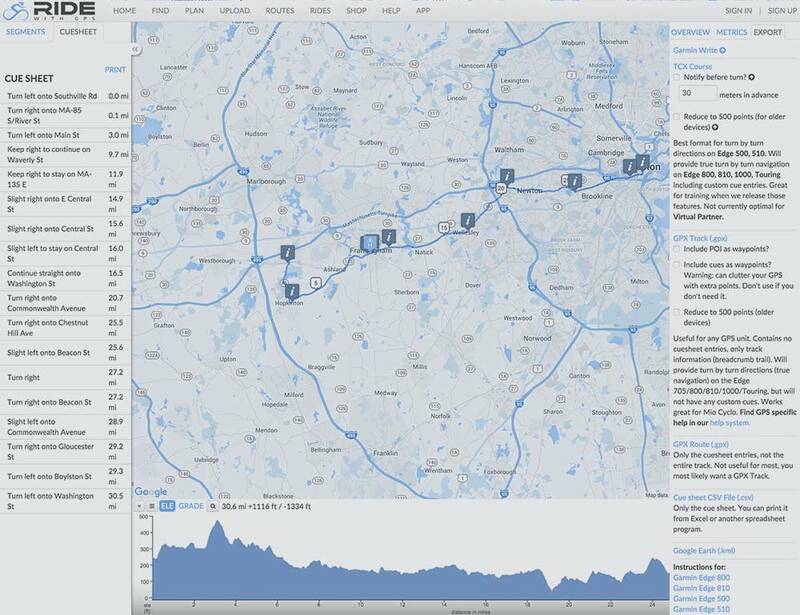 Ride the marathon route on your own or with friends, at your own pace, and choice of time. 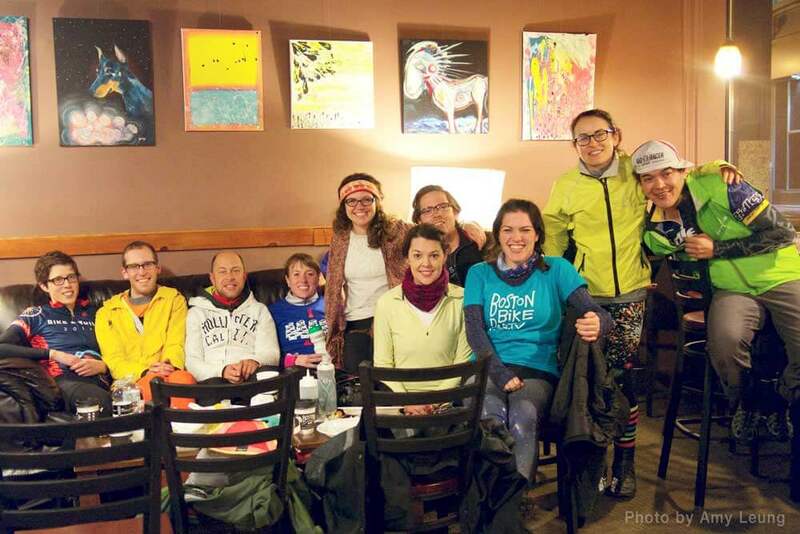 Find a ride or carpool: Convince a friend or family member to give you a ride, or post in our Midnight Marathon Community Group to seek & organize group transportation options, including car pools and shared taxis. Ride out and back: Ride out to Wellesley (the halfway point) then back into Boston as the others reach you for a 26 mile adventure. Or, if you’re in good shape, join the existing group ride organized by Ride Crazy. 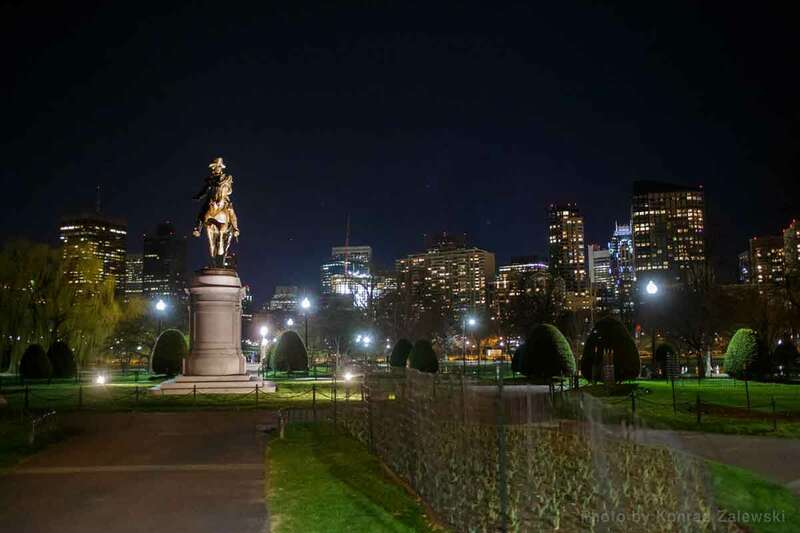 Their 50+ mile ride leaves Boston by 9pm for a leisurely ride to the starting point. Take an earlier train: There are trains from Boston to Southborough nearly every 2 hours, however, bikes aren’t allowed on many departures the night before the Boston Marathon. Your mileage may vary. Want to help keep the community tradition alive? We are in need of volunteers for a few key roles, including a very small number of extremely fit, friendly, and patient people to help load and unload bikes from 8:00pm to 12:30am. These Super Volunteers will also bike slower than the crowd to perform a sweep. It’s a long night and extra work, but it’s also a lot of fun, with great people, and free bike delivery. Bring a print copy of the cue sheet and map, even if you are bringing your phone with the GPS route. It’s important to have an analogue backup in case all else fails. Something warm for the colder temperatures (it tends to be colder outside the city… and at night). Layers you can take off or put on are key. Bring something to keep your hands, feet, and head warm. bring an extra pair of wool socks, warm and waterproof gloves, and earmuffs or some kind of scarf or ski mask. Bike tights or shorts. Or any tight non-cotton underwear. Trust us, riding 2-3 hours on a bike with chafing is no fun, and tights or bike shorts WILL help. PLEASE PLEASE PLEASE be extra careful at the train tracks or your wheels will slip (the metal is surprisingly slick) or get stuck in them, catapulting you into the pavement. It’s more common than you think. There are a total of three track crossings on the route (two in Framingham, and one in Cleveland Circle, all marked on our online route) and every year countless people cross them at a bad angle and sometimes get hurt. You must either walk your bike across the tracks or slow down and bike across perpendicular to the tracks. 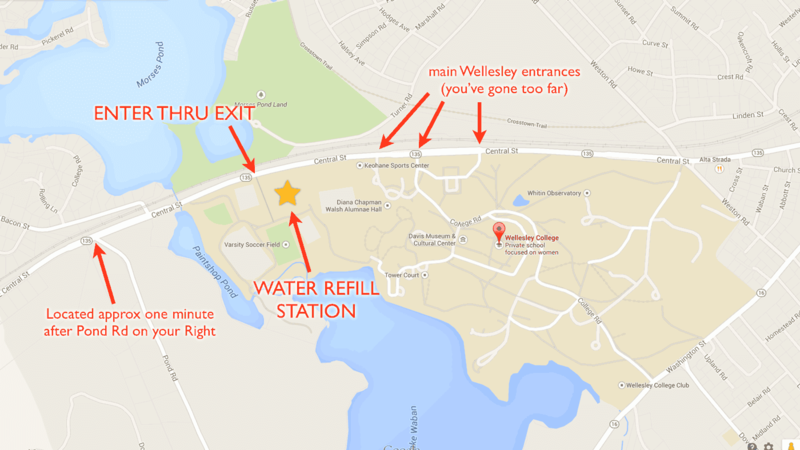 In previous years we offered a rest stop in the Wellesley College area where you could refill your water bottle, partake in an impromptu dance party, and eat snacks (subject to how hungry the previous attendees were). However, this is not guaranteed to happen this year so please come prepared with plenty of water and snacks! Also, HAVE FUN. 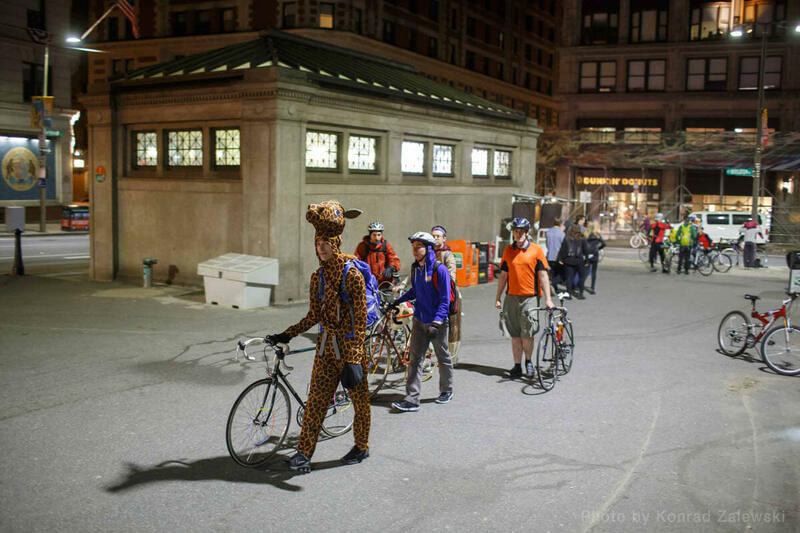 Midnight Marathon is all about being together on bikes with friends and strangers alike! It will be AWESOME. It appears the Finish Line will be open this year. Bike through, take a victory photo, high-five friends or strangers, but do so VERY QUIETLY. There are apartment and hotel rooms with very poor sound insulation along the finish line where marathon athletes and their families are trying to get some sleep before an early start to the actual marathon. Please be considerate and turn down the music and the cheering while turning up your smiles and high-fives. 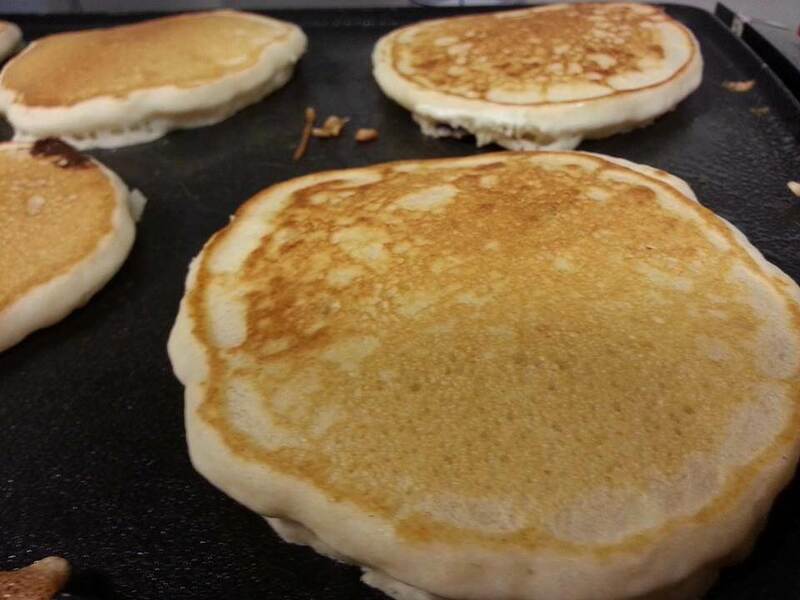 In previous years we coordinated with Boston Common Coffee Co. for a charitable pancake breakfast to benefit The Tyler Foundation. Unfortunately, due to a confluence of circumstances, we won’t be able to offer an organized breakfast in 2019. However, there are a handful of options to refuel in the middle of the night, including pancakes at IHOP in Cambridge (best bet) or the South Street Diner (limited space). You can also carb crash in Cambridge at Clover HFI and Wholesome Fresh, or in the North End at Bova’s Bakery. Bring a heavy duty lock in case you need to leave your bike unattended for a bit. 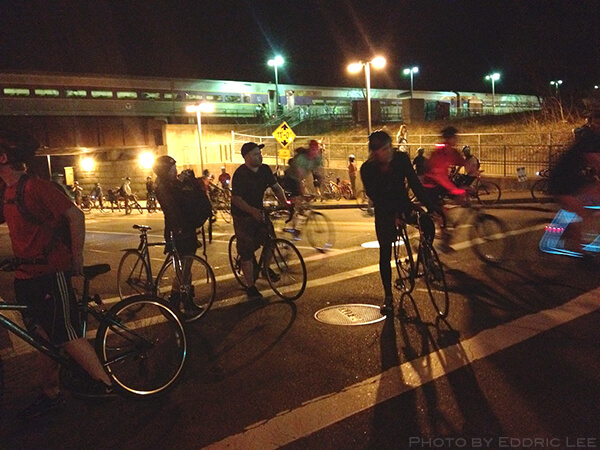 The MBTA shuts down at 1am and reopens at 5:30am, albeit with bike restrictions. If you can’t bike or drive home, we recommend getting breakfast then waiting for the MBTA to re-open; you won’t be the only one.